With winter upon us keeping your pride and joy clean can be a bit more difficult with all the mud and crud both on and off the road. 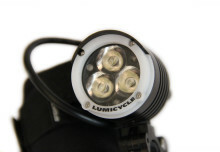 I contacted Muc-Off to test some of their latest gear for keeping your bike in top condition over the winter months. 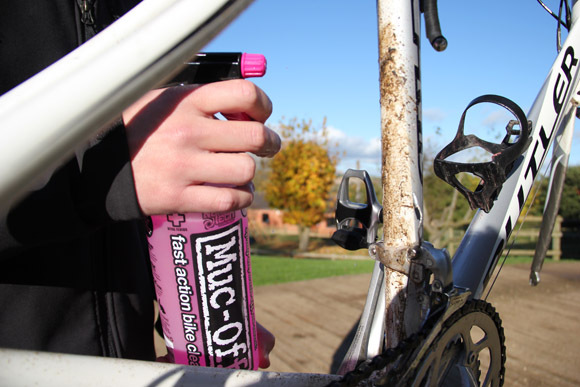 First up I had a go with the standard pink Muc-Off Fast Action Bike Cleaner that is designed to break down the dirt and grime on your bike. The formula comes in a variety of sizes and is easy to apply straight from the spray bottle. Simply give the bike a decent coating of the product and apply a bit more to problem areas where you may have oil marks on the frame. I found to improve results it was good to agitate the product on parts of the frame with a brush and then leave it as directed for a few minutes while the Muc-Off works its magic. This was also a perfect time to test out two of the Muc-Off brushes that I had been sent one called the ‘Claw’ brush and anther simply referred to as a ‘Detailing’ brush. For getting into hard to reach areas the Claw brush was ideal and proved useful in areas around the crank and for getting in and around smaller components. The benefits of using the Claw brush are that while most of the bike cleaning can be purely for aesthetics it’s actually these hard to reach areas that need to be kept free of dirt, grime and road salt to allow them to continue to function correctly. The Detailing brush is larger and is great for scrubbing larger parts of the frame that need cleaning and especially on areas where the bike is heavily contaminated with dirt. It also proved useful for cleaning around the wheels with the triangular shape allowing you to easily get between the spokes. With the Muc-Off Fast Action Bike Cleaner having done its job it was now just a case of rinsing the bike off with clean water. Some areas required wiping with a cloth to remove remaining dirt but I was using a bucket, I think had I been using a hoze with some pressure then it all would have come off without any wiping. Next up to try was the Muc-Off chain cleaner, which is applied with a nozzle on a pressurised container. 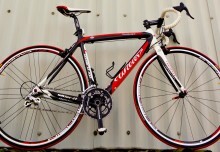 I focussed especially on the cassette and derailleur which had become clogged with a mixture of old lube and crud. I could see the chain cleaner dripping from the components a brownish-black colour as the components started to return to their original metallic colour. The Claw bush came in handy again for getting in between the cassette. Once I had left it for a couple of minutes it was just a case of rinsing off the components and chain and leaving it to dry. I speed up the process with a blast of compressed air! With the chain now dry it was ideal to test out the Muc-Off Wet Lube. With the handy sized bottle I dabbed the blue liquid into the chain links and as it’s bright blue it’s quite easy to see which part of the chain you have already applied the product to. For some reason the Wet-Lube product also had a lovely odour, I think it was supposed to be grapefruit? After using the wet-lube on a mountain bike that is going to be used over winter I then decided that it would be best to test the dry lube on a bike that won’t being seeing much of the outdoors and that is the Urban Limits Schwinn Cutter fixie that is used for the Golden Minute challenge. The Muc-Off Dry Lube comes in a small pressurised container and has a nozzle on it similar to the chain cleaner which allows you to easily apply it to the chain and other components. 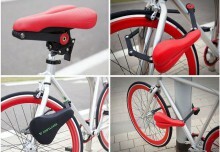 It bonded well with the chain and there was no noticeable ‘fling’ of the product afterwards which is ideal if you are going to be using your bike indoors on a turbo trainer over the winter months. Of course it’s no good having a lovely clean bike if your helmet is all grotty (no sniggering at the back) so Muc-Off have also come out with a small bottle of helmet and visor cleaner. The small bottle gives a misting spray that you simply apply to your helmet and wipe off again leaving it all shiny and filth free with only a small amount of the product used. It’s also ideal for cleaning goggles, glasses and visors and leaves a streak-free finish which is useful for seeing where you are going. Muc-Off also sent me some of their anti-fog treatment which comes in a similar bottle to the Helmet & Visor cleaner. I tested this by applying it to some glasses with a quick spray and wipe off application. By breathing on the treated lens vs the untreated lens it was obvious how well it was working. This was a very quick test though and we will be re-testing this in colder climates with goggles etc in future to see if it can withstand harder testing. The beaded wipes are great for getting oil and other cleaning products off your hands while they can also be used on tools and to clean areas of your bike. I found it very handy for getting around the suspension on this mountain bike. Finally, the Muc-Off ‘dry shower’ product does a good job of removing dirt and is a mousse-like product that smells strongly of coconut so as long as you don’t mind ending up smelling like a bar of Bounty then it’s ideal for a quick wash down of your components after a long ride.